Today is one of those days, when I feel, a homily might steal the gospel reading of its depth. The parable that we heard read is a much-quoted story and we are all too familiar with it. Perhaps I might just challenge that familiarity, so that the Word of God may become alive in us today. Usually in stories and movies, there are three types of main characters: the hero and/or the heroin – the protagonist, around whom the story revolves; there is the anti-hero – the antagonist who creates a conflict which the hero attempts to resolve; and the supporting characters, who contribute to the events that lead up to the conflict. There would also be the minor characters (like the servants), and ‘the extras’. In the parable of today, there are clearly three main characters: the elder son, the younger son, and the father. Who do you think is the hero, who is the anti-hero, and who is the supporting character? Often this story is called the parable of ‘the prodigal son,’ creating the impression that the younger son, who “left for a distant country” (Lk 15:13), is the hero of the story. Some suggest that this story be called, the parable of “the prodigal father” or “the parable of the good boy and the bad boy”. These seem meaningful. Most versions of the Bible entitle this story as “the parable of the lost son” (GNB, NIV) – suggesting that even the elder boy could be the lost son. To resolve this dilemma, I think, we should look at the whole chapter 15 of the Gospel of Luke. So he spoke this parable to them.” Though it is not explicit, we can assume that Jesus spoke this parable to the Pharisees and scribes. Jesus is with sinners because they sought his company; now Jesus tries to seek also the company of the Pharisees and scribes, as he tells them this parable. Actually Jesus tells them three parables: the story of the lost sheep (Lk 15:4-7), the story of the lost coin (Lk 15:8-10), and the story of the lost son (Lk 15:11-32). In the case of the first two stories the heroes are clear: the man who lost his sheep, and the woman who lost her silver coin. It follows then that the hero of the third story is the father. My reflection today, however, is about the anti-hero. Who is the anti-hero in this story? It is important not to lose the final twist in Luke’s stories. We can easily think that it is the younger son, the so-called ‘prodigal son’, who is the anti-hero. I don’t think so, because he was lost but was found. He is like the sinners, in the beginning of the chapter, who sought Jesus. On the other hand, the elder son – the dutiful son – is the one who is still outside the home, out of the celebration, unable to respond to the love of the father. It is interesting to contrast the lines uttered by the two sons to their father, who went out to meet them, in the gospel of today. 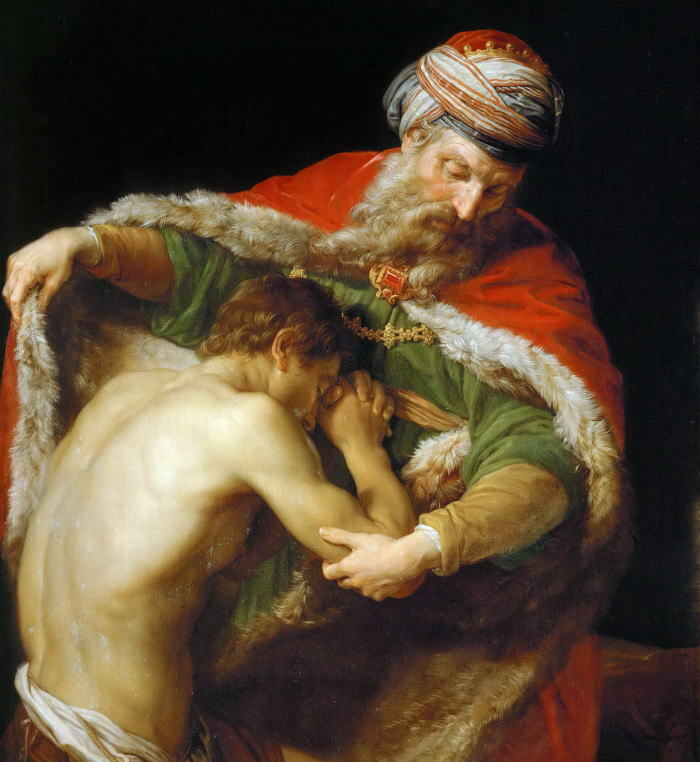 The prodigal son opens his lines with the word, “Father!” But the dutiful son says, “Look!” The younger feels he is not worthy to be a son (Lk 15:21), but the other has always been a slave, and wants to be so (Lk 15:29). There are two other things that are important to look at in the words of the elder son: “Look, all these years I have slaved for you and never once disobeyed any orders of yours, yet you never offered me so much as a kid for me to celebrate with my friends. But, for this son of yours, when he comes back after swallowing up your property — he and his loose women — you kill the calf we had been fattening” (vv.29-30). First of all, he thought being good means just obeying rules. Poor guy, he never enjoyed life. He thought life is about slaving for his father. He was in the house of the father, but never made it his home. He was near the father, yet so far away from him. Secondly, by distancing himself from the father, he has also distanced himself from his brother. He refers to his brother as, “this son of yours”. He passes judgement on his brother – supposing that he swallowed up all the property with loose women – prostitutes. But that is not what the narrator (Lk 15:13) says in the beginning: “he squandered his money on a life of debauchery” (‘debauchery’ means extreme indulgence) and other translations render the same expression as -“in reckless living” (GNB), or “in wild living” (NIV). So the idea of ‘prostitutes’ comes from the elder son (Lk 15:30). Perhaps the Word of God today invites us to look at ourselves – we, who are gathered here for this Sunday celebration, in obedience to a church law, feeling proud that we are not like the rest of them outside the church. Do I obey God or do I love him? Do I feel I am a son or a slave? I was tired of hearing those stories. They were not my stories. After all, I was not a drunkard, nor a drug addict, nor a womaniser. How could this retreat help me? I thought I was really at the wrong place. As days went by that week I knew I was the lost son. Thursday evening that week was my moment of home-coming. That is a matter for another homily. But in short, God invited me to experience Him in His Son, Jesus. And I can only say my life has never been the same. That retreat taught me that conversion is not merely a bad person becoming good, but any person experiencing the love of God, The Father! Luke does not tell us what actually happened at the end of the story in today’s gospel. Did the elder son actually go in to join his brother and celebrate? Or did he decide to go on with his life, fulfilling ‘duties’? In the Gospels, celebration is also a symbol of the Kingdom of God- ‘heaven’! Would I be willing to share in the celebration thrown open by the Heavenly Father, even if that would mean, I will find myself in the company of those who squandered their time in loose living?